The HRP-4C robot is unveiled at the National Institute of Advanced Industrial Science and Technology outside Tokyo. The Japanese researchers showed off the humanoid that will soon strut her stuff down a Tokyo catwalk. The girlie-faced humanoid with slightly oversized eyes, a tiny nose and shoulder-length hair boasts 42 motion motors programmed to mimic the movements of flesh-and-blood fashion models. "Hello everybody, I am cybernetic human HRP-4C," said the futuristic fashionista, opening her media premiere at the National Institute of Advanced Industrial Science and Technology outside Tokyo. The fashion-bot is 158 centimetres (five foot two inches) tall, the average height of young Japanese women, but weighs in at a waif-like 43 kilograms (95 pounds) -- including batteries. Hamming it up before photographers and television crews, the seductive cyborg struck poses, flashed smiles and pouted sulkily according to commands transmitted wirelessly from journalists via bluetooth devices. The performance fell short of flawless when she occasionally mixed up her facial expressions -- a mistake the inventors put down to a case of the nerves as a hail of camera shutters confused her sound recognition sensors. She has a slightly manga-inspired human face but a silver metallic body. "If we had made the robot too similar to a real human, it would have been uncanny," said one of the inventors, humanoid research leader Shuji Kajita. "We have deliberately leaned toward an anime style." "We unveiled this to attract attention in society," said Junji Ito, a senior official at the institute, who said he saw the HRP-4C as a stepping stone toward creating a humanoid industry. "It's important that people feel good about humanoids and want to work with them," he said. "We shifted from a dry mechanical image to a very human image." The preview was a warm-up for the robot's appearance at a Tokyo fashion show on March 23. Like her real-life counterparts, HRP-4C commands a hefty price -- the institute said developing and building her cost more than 200 million yen (two million dollars). 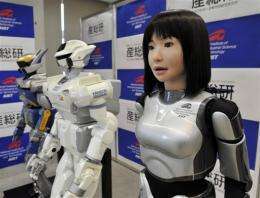 Hirohisa Hirukawa, another researcher, said the institute hoped to commercialise the humanoid in future. The core model would retail at around 200,000 dollars -- not including the cost of her outer shell or whatever designer labels she may be wearing.